Kailyn Lowry Leaks That Her Cast Mate Is Pregnant? When Leah Messer first became pregnant, she was in the same boat as all of her 16 and Pregnant co-stars. It wasn’t until she was a little farther along that she realized she’d be having a totally different experience: she’d be raising twins! After eventually splitting from her first baby daddy, Leah found herself pregnant again with her second husband, Jeremy Calvert. We all know how that ended: with Leah once again single and raising three adorable little girls. These days, Leah isn’t as single as fans may have thought. She recently revealed there’s someone special in her life that will look familiar to many dedicated viewers. Now it seems like that relationship might be getting pretty serious… since Leah Messer might be expecting another child! 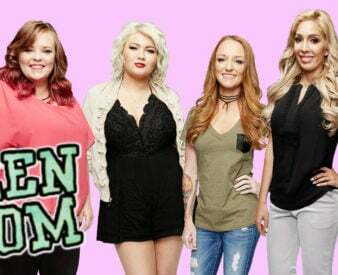 Pregnancy rumors for the Teen Mom cast aren’t exactly rare, but this time around, it’s the origin of the rumor that has fans shocked: Leah’s BFF Kailyn Lowry! For months, it seemed there was something different about Leah Messer. From subtle clues to cutesy pictures, it seemed that Leah was with someone new. It wasn’t long before Leah revealed that she was in fact with someone… someone old, that is! Confirming fans’ suspicions, Leah recently revealed that she had a secret relationship with her ex husband, Jeremy Calvert. Unfortuantely for fans who want them to work it out, it seems their relationship has only been physical. “[We filmed about] us being like ‘We should just get back together’ and about us hooking up,” Leah revealed on Kailyn Lowry’s podcast. She even revealed that she thought about getting back together with him. It’s clear that whether or not Leah and Jeremy are officially dating, they’re having the kind of fun that could end in an accident. And now it seems that some think she could be pregnant. Pregnancy rumors aren’t rare for the Teen Mom s, and Leah is no stranger to them. However, she might be new to having her own friend and co-star be the one who’s spreading the rumors around! Now it seems that’s exactly what Kailyn Lowry is doing. Whether or not Leah is pregnant, it seems that fans are torn about one thing: whether getting back with Jeremy would be good or bad. Although many are thrilled, some fans are not happy with the idea. “Typical f**k boy. He sees her glow up and now wants to be a part of it,” wrote Reddit user MrsSmartyPants. “I knew this would happen… Hopefully she isn’t ‘too deep’ into all this hooking up nonsense because he isn’t going to change. He will always be a douche bag and she deserves better…” wrote Pinkiexoxoxo.